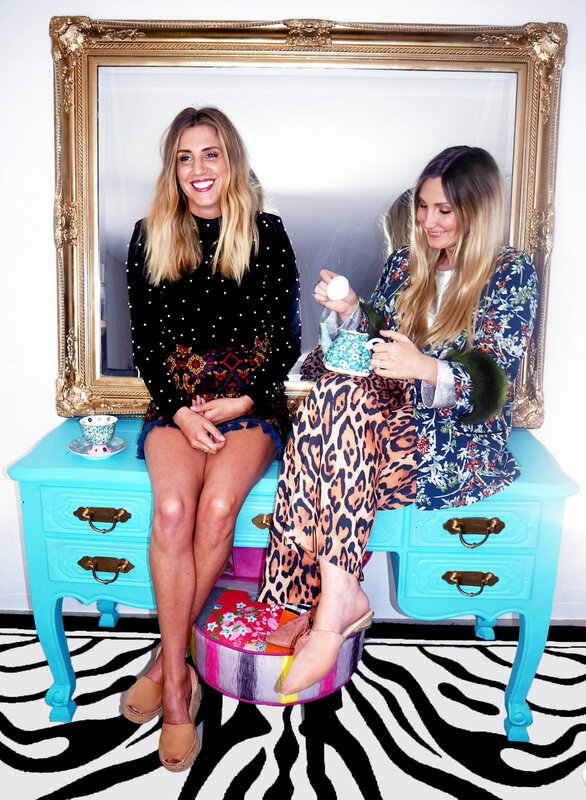 Sister’s-in-law Jenny Sewell and Gemma Taylor share more than just a business. Both from the UK and now call Australia home, they share a love of fashion, are extremely passionate and are both busy mamas (who both happened to suffer from severe morning sickness also known as Hypermises Gravederium during their pregnancies). But despite being severely ill during their pregnancies, the pair still managed to dream up, start up and build up their own successful business. Growing up in the UK, the pair were familiar with the style and craftsmanship that goes into Authentic Avarca sandals hand made in Menorca, a small island off the coast of Spain. Living in Australia, Jenny & Gemma knew that with our sunny climate and beach-loving lifestyle they were destined for the Aussie market. Armed with 40 of the sandals in their suitcase and some big ideas, the girls returned to Oz to make their dream a reality, selling them to friends and throwing ‘Palmaira Parties’, and the word quickly started to spread. Flash-forward five years –and five children between them - and their business is booming. We chatted to Jenny and Gemma about their motherhood journeys, mixing business and babies – and of course fashionable footwear. Can you tell us a little bit about your backgrounds and your motherhood journey? Gems: I have two gorgeous little boys, Flynn, three, and Arty nearly two. Both my boys were the result of a long IVF journey; in fact, Arty was the first of a particular type of embryo to be transferred in IVF Australia, which was quite an incredible experience. I am currently 40 weeks pregnant with a little girl, which was such an exciting natural surprise. All my pregnancies have been difficult in that I suffered sickness throughout but this pregnancy I was diagnosed with Hypermises Gravederium which is a debilitating pregnancy sickness condition. I was between my bed and hospital for the first three months, which impacted our family hugely as I was unable to care for my two small boys. In fact I was vomiting over 30 times a day most days. Being a mother is the hardest and most rewarding experience of my life. It is a juggle but I wouldn’t have it any other way! Jenn: I moved to Sydney when I was 23 with my now husband and havw been living in Sydney for nearly 10 years. Gems is my sister in law as well as my partner in crime! I am extremely lucky to have two little people - Betsy Bluebelle who is three-and-a-half years and Bertie who is 16 months. To me being a mother is the most rewarding and incredible thing in life but wow it can be super tough at times as all us mummies know!! My pregnancies were difficult I had HG first time around and can honestly say it was a very dark period of my life, struggling with the constant sickness. It’s only looking back that I realise how much this affected me and my relationship with my husband - I was not a glowing and happy ‘mum to be’. Thankfully after little Betsy came along I was back to myself and truly happy to have an amazing little bundle of joy. Second time around, Bertie tried to exit at 24.5 weeks so it was a very stressful time but my little man hung in there and I happily gave birth at 40 weeks! Motherhood for me is that crazy bubble of young children and being a business owner, which gets slightly manic at times but I just love it! We had talked about doing our own label for some time and in the midst of this we were back in the UK for Jenn’s wedding and we discovered Palmaira Sandals founded by sister duo Lisa and Tracey. We knew the style of sandal well and had worn them through our childhood and we just knew they would be the perfect for the Australian market. And so we brought our first 40 pairs and sold them to friends and family, through Facebook and we also did Palmaira Parties! We used to take the sandals and a bottle of bubbles to a group of friends at home so they could try and buy. Very quickly we knew we had to create Palmaira Sandals Australia and we started designing our own styles. A great friendship with the UK sisters has flourished and we all work really hard to keep the rich heritage of the traditional Avarca at the heart of the Palmaira brand. What are the biggest lessons you have learnt along the way? A fair few. It has taken some time to realise that there will always be problems and there is no end to the “to do list’. In fact you just deal with one problem and the next one arises. Where we have grown as people and business owners is to recognise that there are no failures, there are lessons and every mistake leads to something better if you look at it in the right way. We always say ‘everything happens for a reason’ and sometimes we don’t find out the reason for weeks, months or years later but one thing leads to another. Also a big one for us is recognising that for us there is no ‘work life balance’ but for us work life integration. The struggle of being mum and business owner is a tough one but once we took the pressure off and blended both it became far easier for us! What is your best tip for running a business while being mums? You are only able to work if you know your children are safe and happy, so do whatever it takes to make that happen. We had our babies with us in the office, warehouse or wherever we needed to be, we just made it work. But when the time is right for you, get the best daycare or best nanny to help. Make everything accessible at your fingertips so you can be mobile & run your business on the go or from home with sick kids! We have spent many a night breastfeeding in the early hours of the morning responding to emails or social media! How do you manage “the juggle”? Well I guess we do manage it even if at times we feel like we are sinking. Sometimes we need to remind each other to cut ourselves some slack and that we are doing a good job. I guess we always feel we could be doing something better as a mum or improving the business. It’s easy to forget what you are doing well and that’s what we try to focus on. Every day is different with children and in business - we just do the best we can and that’s ok! Who do you two look to for inspiration? Gems: I’m not sure really. I don’t know that I look to one person but I do find a lot of inspiration across various people on Instagram. So many men and women doing their own thing and finding their own niche in the market. I find them all inspirational and I love being a part of that network. Jenn: I take inspiration from a range of different things in my life including lots of different people, memories, places and books. What advice do you have for mums keen start their own business/side-hustle? Find something you are genuinely passionate about, something that excites you. There are often times we have to deal with major issues with only one hour of sleep so you need to love what you do to get you through! Then just dive in and figure it out as you go. Be adaptable and flexible! Business is a rollercoaster full of twists and turns; you never know what you will get from day to day. Take feedback and use it and most of all you need to make mistakes to grow. Has motherhood changed your approach to business or life in general? Absolutely, we don’t have time to sweat the small stuff that’s for sure. If we didn’t have children we could work all hours under the sun, without having to worry about anyone else. But once you have children, that simply isn’t an option. It’s the first time in your life you have to be, at times, truly selfless. Because you don’t have limitless time, you have to prioritise, work faster and smarter. I think you look at life in general in a very different way once you become a mother; you certainly find strength which you never knew existed. What do you do when you have some precious downtime? Eg. How do you practice self-care? In all honesty we rarely get downtime. We started the business when we were both pregnant with our first babies, which was a little crazy ha! The business has grown quickly in the last four years and adding four children soon to be five in the mix is full on so it’s taken everything from us but we love it! The children are still very young so the weekends are all about them! We are trying to make some more downtime in fact we hired a house in Berry a couple of weekends ago. Got the kids down for a nap at lunchtime and went off shopping together for two hours which was pure bliss! If you weren’t running a shoe empire what would you be doing? We would be designing clothes for sure or doing something in that space. We both love fashion and being creative it’s something that we are so passionate about. Now to the shoes! What are the biggest trends you guys are seeing for this summer? Gosh this sounds crazy but we don’t know what trends are on the way this summer! Which sounds mad for two women that have a sandal business haha. There’s obviously lots of espadrilles which we have seen but we don’t design our collections based on trends its more just we feel and would love to wear. What are your personal favourite styles? Jenn: Silver Glitter which I actually wore later in the night at my wedding in Ibiza and the peachy espadrille. What about fashion - how will you be styling your sandals for the day/night? We absolutely LOVE seeing how everyone else styles Palmaira’s!! We both love a bit of colour clash and bright colours so a pair of the Dorothy espadrilles with some overalls, simple tee and a great jacket or linen with some of our basic everyday range like the Tan or Khaki Nubucks.